You′ll never fall into the tourist traps when you travel with Frommer′s. It′s like having a friend show you around, taking you to the places locals like best. Our expert authors have already gone everywhere you might go––they′ve done the legwork for you, and they′re not afraid to tell it like it is, saving you time and money. No other series offers candid reviews of so many hotels and restaurants in all price ranges. Every Frommer′s Travel Guide is up–to–date, with exact prices for everything, dozens of color maps, and exciting coverage of sports, shopping, and nightlife. You′d be lost without us! Turn to Frommer′s for complete, up–to–date coverage of Europe′s most scenic and unspoiled region. 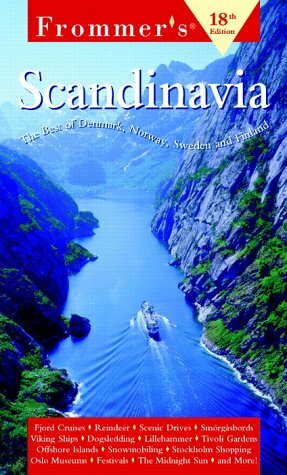 In one easy–to–use guide, you′ll find the very best of Denmark, Norway, Sweden, and Finland, from city sightseeing to wilderness adventures, fjord cruises, and great small towns. Loaded with detailed maps and smart tips that help you stretch your dollar and plan your trip more easily, our guide features accommodations for every taste and budget, the best in authentic dining, and terrific shopping finds. We′ll take you to Renaissance castles and Viking ruins; outline spectacular driving tours; recommend the best cruises; and cover the best of the magnificent countryside, from dogsledding and reindeer safaris to fishing and hiking in the Land of the Midnight Sun. About the Authors Co–authors Darwin Porter and Danforth Prince have written numerous best–selling Frommer's guides, notably to England, France, the Caribbean, Italy, and Germany. Porter was a bureau chief for the Miami Herald when he was 21, and Prince was formerly with the Paris bureau of The New York Times. They are also the authors of two other Scandinavia titles: one devoted to Denmark, another to Sweden.